Racism and Cruelty: What’s Behind the GOP’s Healthcare Agenda? 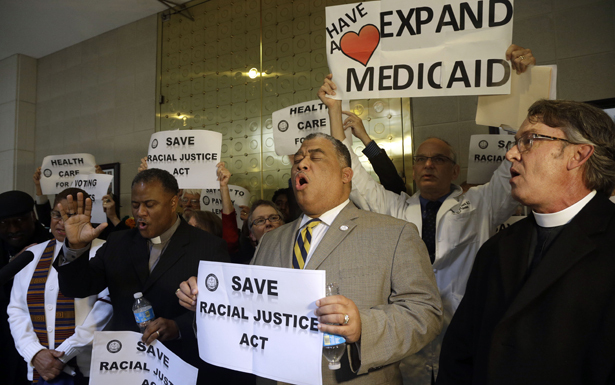 Republicans replay their Southern Strategy in an attempt to undermine the Affordable Care Act. Before he was disgraced into resigning his presidency over the Watergate burglary scandal, Richard Nixon had successfully engineered an even more odious plot known as his Southern Strategy. The trick was devilishly simple: Appeal to the persistent racist inclination of Southern whites by abandoning the Republican Party’s historic association with civil rights and demonizing the black victims of the South’s history of segregation. Why anyone who claims to be pro-life would want to deny health care to single mothers is an enduring mystery in the morally mischievous ethos of the Republican Party. But the exclusion of a working poor population that skews disproportionately black in the South is simply a continuation of the divide-and-conquer politics that have informed Republican strategy since Nixon. The game plan of gutting the Affordable Care Act despite its passage into law and before its positive outcomes are demonstrated can be traced to a “blueprint to defunding Obamacare” initialed by the GOP conservative leadership under the aegis of Heritage Action for America. Ironically that is the political front of the Heritage Foundation, the leading GOP think tank that is credited by some architects of Obamacare as the initial inspiration of their health care program. The difference is that whereas the Heritage Foundation was pushing a mild health care reform based on increased profit for private insurers, as in the plan Mitt Romney introduced in Massachusetts, the Republicans object to the provisions in this president’s program that broaden access for the needy. They were abetted in this decision by a Supreme Court ruling last year granting the states the option of not expanding Medicaid to cover the uninsured under the new act. As a consequence, 8 million of our fellow Americans with annual incomes of less than $19,530 for a family of three have been prevented from obtaining the health care coverage that we as a nation decided to grant them. It might seem odd for governors to reject a program to help those living in their state that is fully funded by the federal government for the first few years and then 90 percent covered by the feds thereafter. But turning down a federal program to aid your own state’s population makes perfect sense when connected with the racist appeal initiated by Nixon that has turned the once Democratic South into a rock solid Republican bastion. There are certainly many whites among the 435,000 cashiers, 341,000 cooks and 253,000 nurses aides who the Times estimated will be denied needed health care in the states controlled by Republican governors who have decided to veto the most important provision of the Affordable Care Act. But that also means that almost 44 percent of the poor and uninsured in Mississippi are white, and the gutting of this program that hurts them is evidence of the false consciousness that informs racist appeals. As the Times points out, someone, black or white, making $11,000 a year frying chicken in a convenience store falls into the gap of making too much to qualify for the state’s existing Medicaid program but not enough to be subsidized under the new health care plan as the state defines it. For those who lose out, there’s what the Republican die-hards call tough love. That’s not love. It’s hate. Zoë Carpenter outlines the GOP blueprint to sabotage Obamacare.